It’s a bit old hat and clichéd to sneer at New Year resolutions. That’s the sort of predictable, unimaginative response you’d expect from one of those ghastly identikit panel show ‘comedians’ that will hopefully go out of fashion next year. People generally make resolutions because they want to make life better. OK, they often fail to keep them, but at least they’re trying. The people you should really be wary of are the ones that have given up altogether, and seem to regard their hopelessness and lack of ambition as some sort of badge of honour. These are the sort of British TV comedy misanthropes who, inexplicably, are often hired as celebrity hosts at awards events for the IT industry. “I’ve noticed my resolutions involve me not doing stuff I wasn’t going to do anyway,” runs one of his attempts at sagacity, “so I’m going to retrain as a Latin teacher in a provincial public school.” Note the classic themes of the ‘alternative’ comic: anti-education, class-obsessed and London biased. ‘Provincial’ eh? If it wasn’t for his mockney accent, anyone would think Mr. Smith was a bit of a snob. The IT industry may have its faults (I think we have even have touched on them in this website) but you have to admire the sheer tenacity of the people in this sector. If everyone was like Arthur Smith, they’d all just give up at the first challenge. But most IT people, being problem solvers, don’t collapse in a pathetic coughing, wheezing heap at every minor setback. Another great contrast, between the good people of the IT sector and the anti-scientific, hopeless failures of the comedy industry, is that technologists are relentlessly optimistic. Most of them genuinely want to make the world a better place (even if they inadvertently create the opposite effect). The only valid point Smith might have actually made was about the failure of most resolutions. Resolutions usually fail because they are too ambitious and the underlying mindset of the person hasn’t changed. For example, you can’t give up smoking without making major lifestyle changes (like giving up drinking). So most resolutions need a solid foundation. 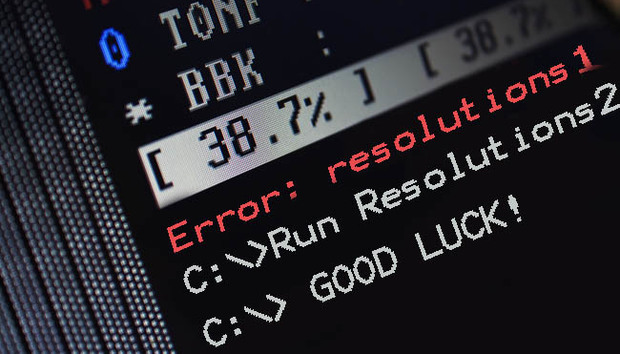 For that reason most IT industry-related resolutions need to be edited down, because they prove to be too ambitious and take up too much time. If you’re not careful, you’ll end up like a bad cloud – all over the place. Maybe it’s time for Resolution 2.0 – a new version of resolution making that strips out some of the excesses of previous generations of ambition. (Ambition – there’s another concept that would horrify Arthur Smith). While Resolution 1.0 was fine, Resolution 2.0 has a new feature, practicality, where an algorithm spots the (by now) familiar signs of overreaching resolve. Maybe, given the bewildering list of options that IT offers us all, the resolution we should all make is to be more realistic. Sometimes, a bit of myopia can be good for you. Overreaching IT ambition is killing the big five supermarkets in the UK. They were so intoxicated by the power of the Information Age, they offered customers a bamboozling range of products at a terrifyingly confusing range of prices, which never seemed settled from one day to the next. I often found myself walking out of Waitrose with nothing because I was mesmerised by all the complicated buying decisions. Sometimes I only went in for a single item, but selling me one bottle of water, for the price of one, was obviously too simple for the ambitious marketing managers who set prices. Then along came companies like Lidl and Aldi, which actually limited the customer options and sold them stuff in simple multiples, and we all love them. They made me feel safe to make buying decisions without a financial advisor. So in effect, IT has been used by Britain’s big five retailers to frighten customers off, by making everything too complicated and drive them into the arms of their competitors. Whatever your plans for the next year – be they ‘big data’ or ‘big dieter’ – your over riding resolution must be to keep it simple. Less will be more next year. And don’t book any rubbish comedians for your company do. That’s another massive saving you could make.